It was pure chance that brought me to this event. After the Restaurant Week party, Camemberu and Keropokman suggested I join them for dinner at McDonald's. Yea, it wasn't my usual choice for dinner (this cow needs quite a bit to feed four stomachs) but I was intrigued enough to follow them. And what an experience it turned out to be! White table cloth, fresh yellow roses in a vase, metal cutlery, black napkins, a nice printed menu card and table service! WOAH. Could this be real? Seriously at McDonald's? But before I could digest all the surprise and confusion in my head, a (Mc)flurry of staff started to dance and belt out an original song in honour of their new burger! Got song and dance some more ah? Very cool. I could certainly get used to this! Moohahaha. Anyway, an exclusive four-course dinner was held for invited guests who included bloggers, forumers and McDonald's supporters. A section of the restaurant (yes, now I know why all this while, it's called McDonald's restaurant!) was reserved for us and magically transformed into a full-fledged restaurant! I was very happy to see Irene Jansen- a lifestyle singing chef, cook book author and founder of food consultancy business, Culinary Adventures. She was also a fellow Foodie Lunch Pick-er on 938LIVE! Irene was the chef who help put together this four-course menu and even wrote and performed the song! Awesomeness. All four courses were made using most ingredients that were readily available at McDonald's, and of course some specially made by Chef Irene. The first course of Fish & Corn Quiche comprised of cubes of Fillet-O-Fish, corn, egg and BBQ sauce. It tasted sweet and just a tad savoury. I wished it had been more savoury than sweet but..but..I'm stunned. It's served in a porcelain bowl?! The second course of Fresh Salad Greens arrived next. This was fit for this cow as I happily chomped on fresh grass lettuce, tomato slices and corn kernels! The tangy Thousand Island dressing on the side was a low-fat version so when used in moderation, I guess one doesn't feel too guilty. Then the main course arrived! The star of the night. The burger that is the reason for this whole dining experience- The Teppanyaki Chicken McGrill. Instead of sesame seed buns, this was a nice sourdough bread. A little chewy and pretty wholesome. It was no chicken patty here. A deboned chicken thigh was grilled skin-on and assembled with lettuce, tomato and chargrill sauce. Pretty tasty and relatively filling! Yay. Watch out for a series of different flavours for the Chicken McGrill later this year! A nice group photo of fellow blogger friends at the table, courtesy of Yina. 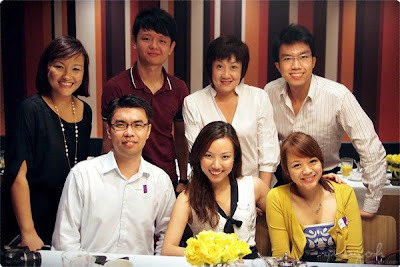 On the extreme left is Petrina Kow (former Class 95 deejay) who was the evening's emcee and did an excellent job! *Clap Clap* Beatrice, ladyironchef, Camemberu, Keropokman and yours moo-lly made up the rest at this table. I woke up the next morning, still trying to believe it was not a dream. Surreal-ness hit not only during the dinner but even for the next few days. Think I need more sleep. And perhaps another dose of McSurreal to keep withdrawal symptoms at bay. Thanks to the folks from McDonald's and GolinHarris for hosting this hungry cow. I'm happy to give away this complete set of McDonald's Food Straps to one person! These miniatures are so cute lah. Drop me a comment here naming McDonald's latest chicken burger (psst...it's featured in this post) and don't forget to include your name and email address! Closing date is 31 March! One lucky winner will be picked by the online random number generator. Me me me!!! The Teppanyaki Chicken McGrill!!! Its - The Teppanyaki Chicken McGrill! thanks for creating another giveaway! Great blog; happy I found you!very informative and great photography! haha Leroy. Those are some mighty cute Food Straps. Commercialism at its finest. I'm such a sucker for it. Thank you all for joining in this draw. Congrats to Jols on winning the complete set of McDonald's foodstraps! If anyone wants a particular foodstrap, go become her best friend. Lol. Sorry YL, Jas, Victoria! Unfortunately I only have 1 set to giveaway. Keep a lookout for you guys! Hahahaha this is seriously weird and crazy! Mala Yong Tau Foo, Anyone?